NATURAL DRIED SLICE SWEET COCONUT FOR EXPORTS..
" Ingredients Recipes delicious coconut jam "
Step 1 : buy the peeled Coconuts removed brown crust , grated into long thin fibers . 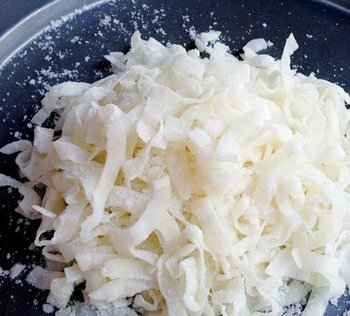 Step 2 : Wash the grated coconut over several times with cold water to all the oil , then drain. Step 3 : Mix the coconut with sugar , coconut soaked for 2 hours or until the coconut , sugar is completely dissolved , while the island can soak about 30 minutes later were infused coconut , if you like can be added with food color color on . Step 4 : North coconut on the stove , heat on low heat . Just boil until the island has dried up coconut water , it sits on the surface of each fiber of coconut , add vanilla if you like , pay attention coconut soup not prone to burning. If you are interested in our products, please kindly contact us by reply this email or the email in the signature, telling us the estimated number amount of our first order, so we can send you the complete quotation. Thank you very much. We hope to have chance to supply our products to you in the near future and waiting for your order.